Due to the ever increasing need for skilled personel HR departments have changed in perception. 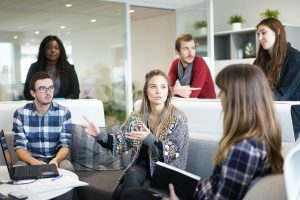 While in the past often viewed as a mere support function, the HR departments are more and more being viewed as a strategic business partner for their organizations. Learning and Training: lessons automatically adjust to students´ ability level and learning speed. The DeepMood technology can even identify ideal learning conditions and training methods. How? The technology recognizes facial expressions and can tell when students have clearly understood lessons or where following the matter is a challenge for them. Recruiting: DeepMood can serve as a support system for identifying the right candidate for a position. The technology can serve as an indicator where applicants hesitate or do not seem to mean what they say. These are the moments where recruiters can dive deeper. Performance Management: Assesss intellectual capabilities of individuals for performing specific tasks. The technology DeepMood can tell specific individuals´ emotions and discover, for instance, truthfulness, stress, anger, fear, surprise, & confidence with a high degree of accuracy. We do not store pictures or video streams of faces or bodies; instead we only store pixels of the face which cannot be reproduced when your database is being hacked or stolen. Also, the DeepEyes technology can work standalone which represents an extra level of confidentiality and privacy. Our unique method of storing has a nice side effect: It enables fast search. As an example the technology can identify a person in a data base of 10 million faces within a second with a standard I5 computer. Interested in starting an AI project? Read more. The DeepEyes technology can be easily customized to your requirements. If you would like to speak with our experts, please contact us and we’ll set it up.